Bath have confirmed scrum-half Peter Stringer is to leave the Premiership club at the end of the season. The 37-year-old arrived at The Rec on loan from Munster in January 2013 before signing a permanent deal six months later. Capped 98 times by Ireland, Cork-born Stringer has made 55 appearances for Bath but is no longer first-choice number nine. 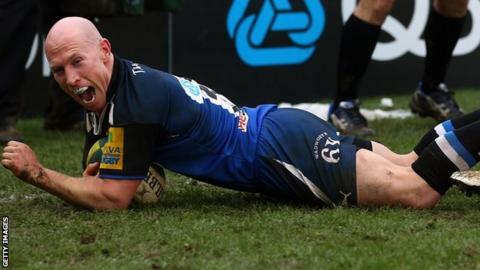 "Peter has been a fantastic servant for Bath," said head coach Mike Ford. "It's a shame we are unable to keep him, but with Niko Matawalu joining, Chris Cook re-signing and Will Homer coming through from the academy, this has become an incredibly competitive position within the squad." Stringer added: "I am, of course, disappointed not to be staying at Bath but I'm very much looking forward to the next chapter of my rugby career elsewhere. "I've had a great two years here. I'm looking forward to seeing how the squad develops in the next few years, and to playing my part over the remainder of the season to help the club finish in style."